Yellowknife! Deh Cho (Mackenzie River)! Nahanni National Park! Indigenous communities and genuine Indigenous Culture! WOW!! The highlight of this tour are the people and places of the Deh Cho (Mackenzie River) region! The warmest of warm welcomes you will get from the local residents from the beginning (Fort Providence) to the end of the tour (Fort Simpson)! Other highlights include the 300km drive from Yellowknife to Fort Providence, a comfortable, historic and amazingly scenic boat ride on the Deh Cho (Mackenzie River) from Fort Providence to Fort Simpson and of course the world famous Nahanni National Park! Leave the hustle and bustle of the modern world behind for a life changing 12 day Indigenous cultural experience! On this tour you will take a step back in time and travel on one of the longest rivers in the world as we once did hundreds of years ago, by canoe. We will travel in 2 – 29ft voyageur canoes, each taking up to 9 guests and 1 or 2 guides, followed by 2 supports boats that will carry supplies and provide safety monitoring. During the day paddling on the river, enjoy the scenery of the river that hasn’t changed for hundreds of years. As a team of 9 paddlers you will navigate your 29ft voyageur canoe down the mighty Mackenzie River. We will spend 6 nights on the river camping at traditional spots that we have camped at for hundreds of years. At each stop each team will be responsible for setting up their tents and camping area. Our Indigenous guides will prepare delicious traditional foods provided by the land. Then after dinner our Indigenous guides will talk about culture and then everyone will participate in our Traditional Hand Games, drumming and dancing. WOW!! On this once in a lifetime adventure you could see the world’s biggest wild buffalo, visit and experience Indigenous communities and Indigenous culture, retrace the historical 1789 journey of Alexander Mackenzie on this very cool and life changing war canoe adventure down the Mackenzie River, enjoy the summer scenery of the northern Canadian wilderness and much, much more! 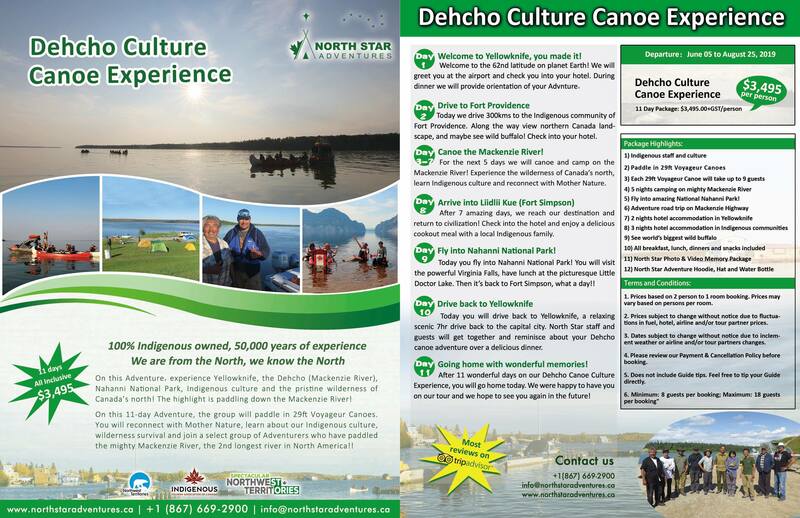 If you’re looking for a more personal canoeing and cultural experience with a local, 100% Indigenous owned tour company, then North Star Adventures is for you! Minimum 8 person, maximum 18 person per booking. Please provide minimum 30 day notice when booking, thank you. Click here to book this cool canoeing and Indigenous culture package! Day 1: Welcome to Yellowknife! Welcome to the 62nd Latitude on planet Earth! We will greet you at the airport and bring you to your hotel. After checking in, we will meet to go over your Tour Package. Afterwards you have a choice to join our fun and informative Yellowknife City Tour, relax or go for a leisurely walk downtown. At 6:00pm we will bring to the scenic Old Town district of Yellowknife for a delicious dinner of local fish at world famous Bullocks’s Bistro! The rest of the evening is free. Today we drive 300kms in our comfortable tour bus to the small, scenic Indigenous community of Fort Providence. Along the way view scenery of the northern Canada landscape, and maybe even see wild buffalo! When we arrive we will check into the traditional cultural camp.After local, traditional dinner, there will be an informative tour of Fort Providence. Tell us all about yourselves, meet your Indigenous guide team. Our team will give a detailed orientation to your upcoming Adventure. You will get familiar with your camping gear and safety equipment and will learn basic wilderness survival techniques and practices. You will also do a trail run in our 29ft Voyageur canoes including paddling on the River giving a local indigenous residents a show as they watch from the river banks. After another delicious dinner you will be treated to traditional Dene games and Drum dance! 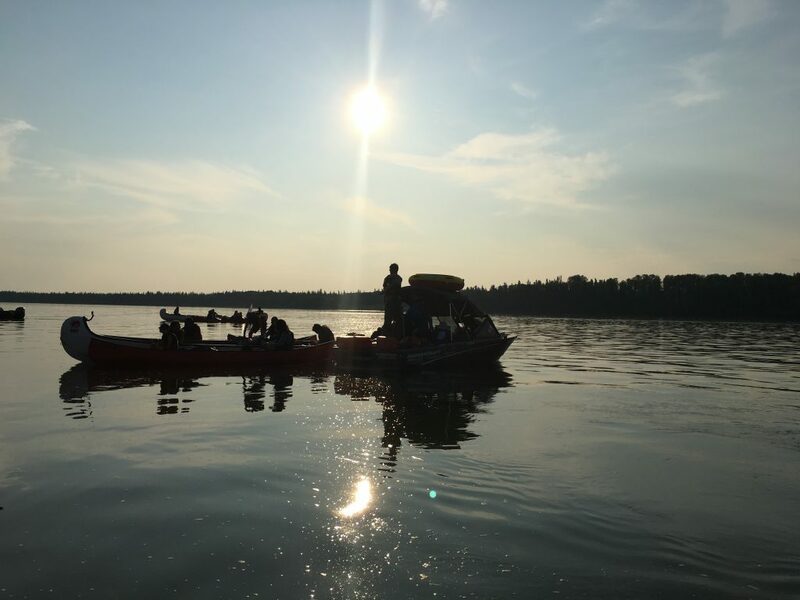 Day 4, 5, 6, 7, 8: We canoe the Deh Cho (Mighty Mackenzie River)! Today we will start canoeing from Fort Providence to the historic community of Fort Simpson almost 300kms away. You’re actually on the Mackenzie River!! One of the longest rivers in the world! We will paddle for an average of 30km to 45km per day. Our Indigenous Support Boat members will go ahead for each of our stops, pick up a camping spot for that night and begin preparing delicious hot meal for you. After dinner our Indigenous guides will perform traditional drum song ceremony and then we will all play Traditional Dene Hand Games!! After 4 nights of wilderness river camping, we arrive at the tiny Indigenous community of Jean Marie River (pop. 70) for a comfortable overnight visit with this wonderful community, a community with beautiful arts and crafts. Next morning we continue on for our final day on the mighty Mackenzie River arriving in Fort Simpson (pop. 1250) in the evening, a fur trading community first established over 200 years ago! Day 09: We arrive into Liidlii Kue (Fort Simpson)! After a wonderful visit of Jean Marie River, we continue on for our final day of paddling on the mighty Mackenzie River to our destination, Fort Simpson, a fur trading community established over 200yrs ago! It’s been an amazing, incredible and challenging 6 days on the Mackenzie River and now you get rewarded with a hot shower, comfortable bed and a much deserved restful sleep in the local hotel. This evening you will enjoy a cookout with a local resident and hear stories about our past or you can go for a leisurely walk around the community and get some great photos! Today you can choose the Nahanni option or visit the community option. Fly into Nahanni National Park on a float plane, getting a bird’s eye view of the majestic Mackenzie Mountains in the distance. First stop is the breathtaking Virginia Falls, almost twice as high as Niagara Falls! After finally pulling yourself away from the falls, it’s back on the floatplane and we head off to one of the most scenic and relaxing spots in the entire Nahanni National Park, Little Doctor Lake, this place is heaven on Earth, wait until you see!! After a late lunch it’s back to Fort Simpson. OR stay and learn the history of Fort Simpson, see the sights and meet the locals, play a round of golf on the Dehcho’s most beautiful golf course on this Option, wow what a day!! Day 11: Drive back to Fort Providence, then to Yellowknife, ROAD TRIP!! Today you will drive back to Yellowknife, a relaxing scenic 8hr drive back to the capital city. Along the way we will cross the Dehcho Bridge that spans over the mighty river you just paddled! We will stop at the relaxing Saambaa Deh Falls and Lady Evelyn Falls, then to Fort Providence for a hot lunch. Then it’s back to Yellowknife, check into your hotel. That evening you will enjoy a delicious wonderful dinner where everyone can reminisce about your amazing Adventures! Day 12: Fly home with amazing, wonderful lifelong Dehcho memories! Today enjoy a warm, hearty breakfast and then we will take you to the airport. It will be sad for us to see you leave, but then we will be happy for you for what you accomplished in the last 11 days, not many in the world have done this, you did!! And we will present you with North Star gifts and for those memories, your North Star Photo & Video Memory USB, to share your experiences with everyone in your world! Thank you for choosing North Star Adventures!! Click here to book this once in a lifetime experience! 1. Prices based on 2 person to 1 room booking. Prices may vary based on persons per room. 3. Dates subject to change without notice due to inclement weather or airline and/or tour partners changes. 5. Does not include Guide tips. Feel free to tip your Guide directly.